Last night Stuart treated me to a night out to see American folk singer Joan Baez at the Royal Festival Hall on London's glitzy South Bank. Moany Joanny (as I like to call her) was in fine fettle - telling jokes... singing other people's songs. OK, I'm doing her a slight disservice as she did sing her own songs too. But it was only in her interpretation of other people's songs like Imagine, The House Of The Rising Sun and Swing Low Sweet Chariot that made the gig really came to life for me. I was in the minority though - the venue was sold out and the adoring, if aging, fans applauded and sang along to each and every song. Stu too was clapping his hands and beaming throughout. Bless him. Her finale was a rousing rendition of Diamonds and Rust which is a corker of a song. Baez has definitely been there and done that. A protest singer who has been imprisoned for her beliefs she continues to be a prominent songwriter, musician, and human rights activist. 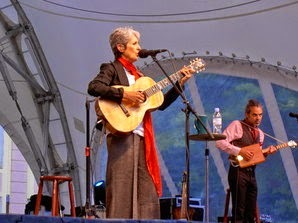 Little known fact: Joan Baez dated Apple Computer co-founder Steve Jobs during the early 1980s.